From compact, affordable HD TVs that are perfect for a bedroom or office to vast 88 inch sets that deliver an awesome home cinema experience, our Samsung TV collection shows off the very best cutting edge visual and audio technology and a broad range of televisions to suit every environment, style and budget. At the very top end of the Samsung TV range is the remarkable Samsung SUHD UE88KS9800 Smart 4k Ultra HD, an 88-inch screen that must come close to offering the most immersive televisual experience available to mankind. Matching sheer size with an arsenal of picture enhancing technologies including Nano crystals that boosts colour detail to make images incredibly vivid and UHD upscaling that converts even lower quality images to high quality super sharp HD. The UE88JS9500s gently curving screen further heightens the remarkable immersive experience. 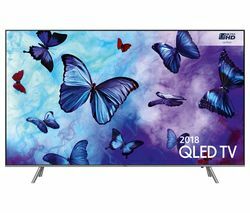 The UE88KS9800 may be an extreme example of Samsung TV design but many of its innovative features are available throughout the range in more modestly sized – and accessibly priced – models. 4K Ultra HD resolution is available on numerous Samsung TVs, ensuring that razor sharp 4K viewing is more accessible than ever before. Other innovative features that are available across the range include Multi-link screens, which allow you to watch two screens simultaneously, and an array of Smart TV services.